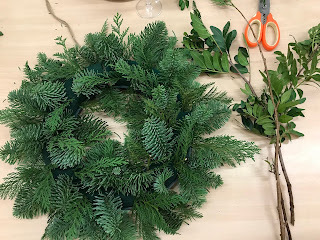 Last week I got to go to a Christmas Wreath Workshop where I got to make my own fresh Christmas wreath. 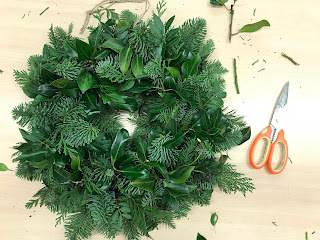 It's so easy to buy a ready made wreath whether it's fresh or not, but I didn't realise how much fun it would be to make instead! This is one of my favourite Christmassy themed DIYs to date and I'm so happy with how it turned out. 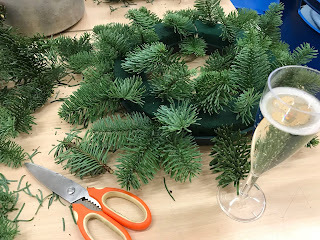 Today I thought it would be nice to share my photos from the workshop to show you how I made it. 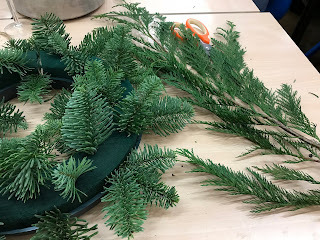 I'm not going to write about it all in detail because you get the gist of it from the pictures, but also because I can't remember the names of all the plants! 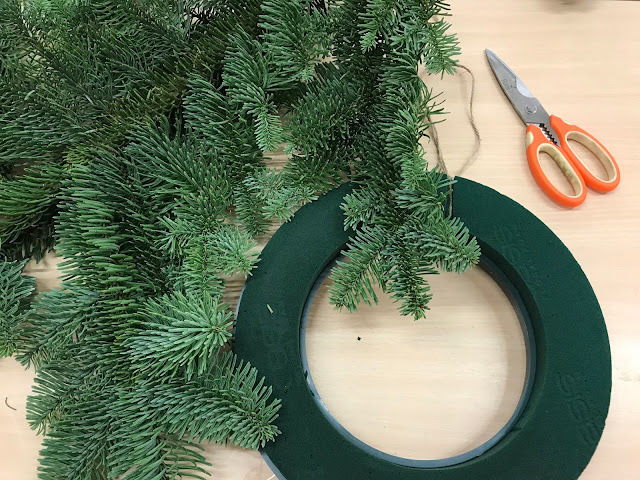 So, I first started off with this oasis foam ring with a plastic base and was shown how I would be using a variety of about 5 or 6 plants to make my wreath. 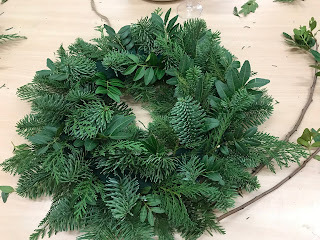 The instruction was to place the plants in in a certain circular pattern to ensure that it was placed with some equal distance between each part and to begin building a wreath with a circular motion to it. The first plant was done and I wasn't convincing myself with my handy work. 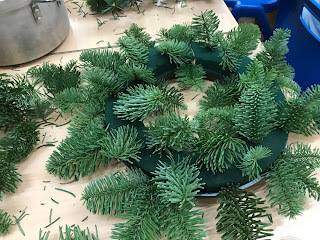 It didn't seem right and I wondered what I would be doing next to make sure that this wasn't going to look like a tatty ring with plants popping out in a hundred different directions. Next I was to place the second plant in the gaps to begin to fill it and to repeat with the next few plants. I remember using pine, holly and ivy but I don't remember the name of the other plants I used. I think there were about 6 altogether. Eventually, I started to see my wreath form. 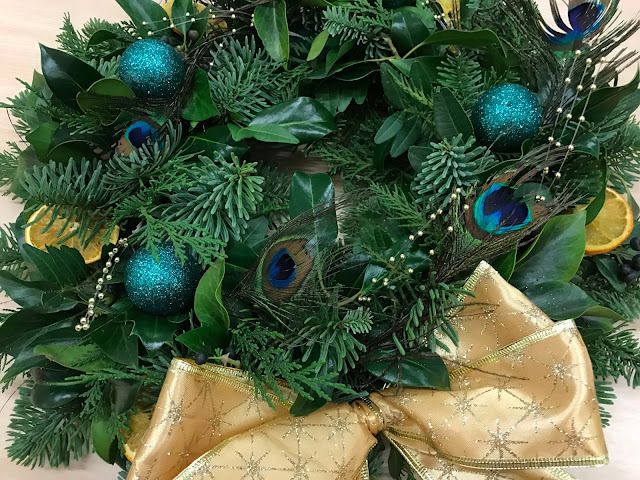 I could see the circular motion I was trying to create in the wreath and I could see the different plants creating different textures and variety. It looks good and I was really happy with it. Next would be the decorations. 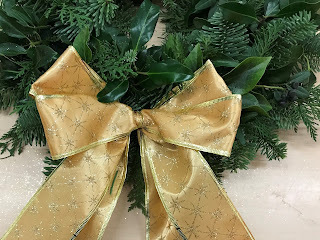 The first decoration on the wreath was to be a bow. I decided to go for a gold bow but there was options for a tartan, red or silver bow. I decided I wanted to do something different from my usual red, silver and white theme and so I went with gold here. I placed the bow at the bottom because I didn't want to cover a lot of my wreath with the bow. I also liked the idea of the bow being at the bottom better than the top. I really enjoyed learning how to make this bow and I might use it in some of my Christmas wrapping. 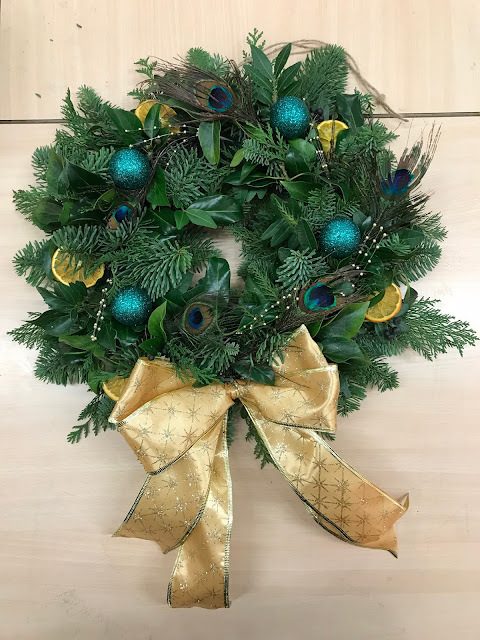 For my wreath I decided to go for teal and gold. 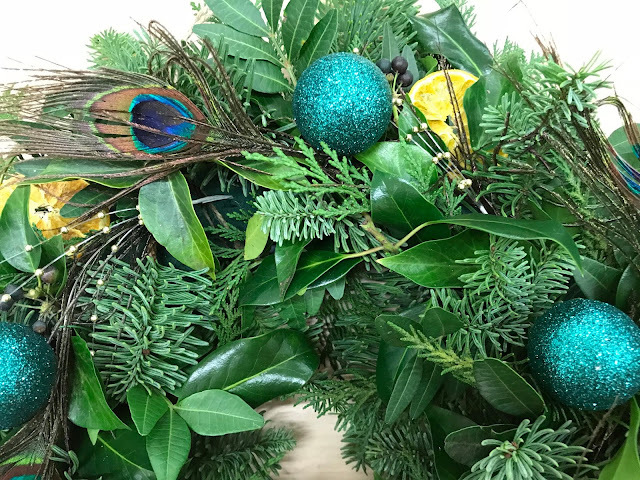 There were tons of decorations to choose from, and in so many colour ways, but I was just drawn towards the glittery teal baubles, peacock feathers and dried orange slices. 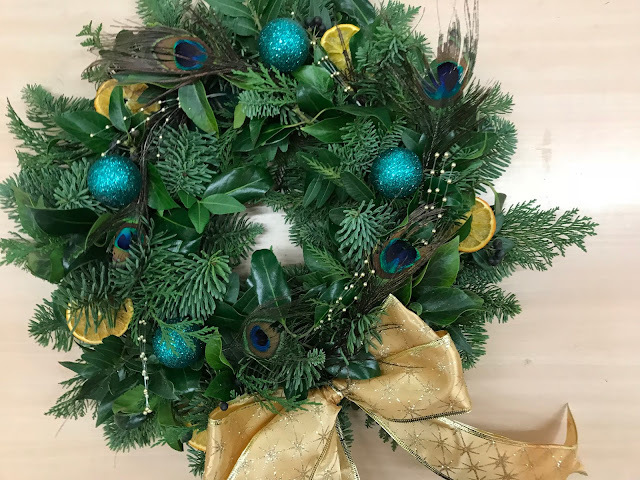 I wanted to continue in my circular motion and places the peacock feathers strategically in a circle pinning them carefully in place with wire. In between I added the dried orange slices to add a bit of colour around the edges and then finished off with the teal baubles in between the slices of orange. 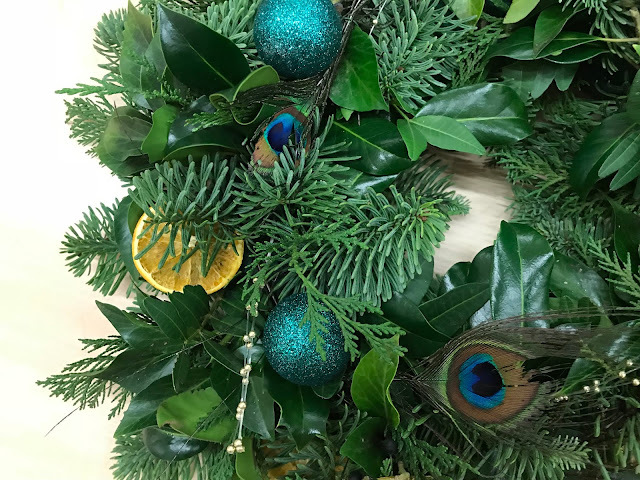 I wanted to add just a touch more gold to finish off my wreath and found these little strings with tiny gold balls on and placed them in the same direction as the feathers and in between them. It subtly completed the look. I could have added a lot more on but I could see that it was finished once that touch of gold was there. Anymore could have been a bit overkill. And voila! 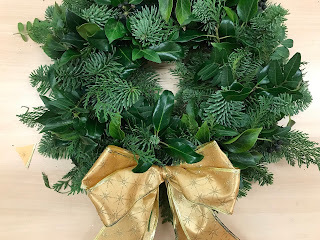 My wreath was completed. I really love this wreath and am really proud of how it turned out. I think my mum is enjoying having it up on the door too but unfortunately because it's quite heavy, I've had to take it down for a bit. I'm having to get something attached to the door to hold it on without falling off (because it has a couple of times). I'm waiting for a drier day than today to put it back up on a hook with some command strips. I'm glad it was inside for the snow though. It could have ruined it! I can't believe how much it's been snowing though! It's so thick where I live and I've been outside enjoying it as much as possible with my family all day. If you're in the UK, how is the snow for you? Do you have any at all? 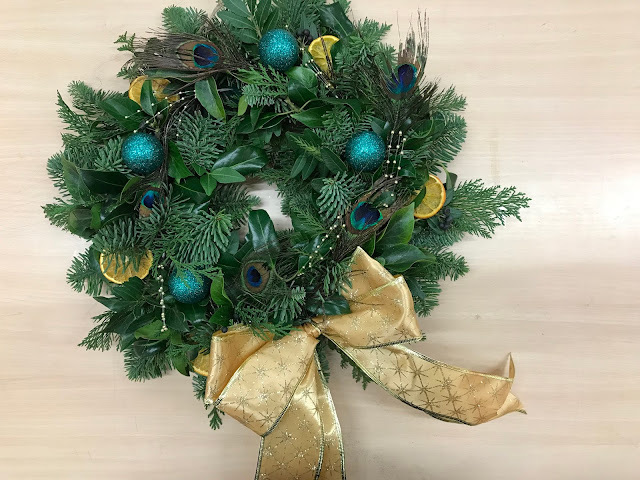 Don't forget to let me know what you think of the wreath! I'd love to hear your thoughts and if you'd make one for yourself. It looks amazing <3 :) I love DIY projects!